This great book for girls continues the Julia Jones series. In this addition, Emmie Walters’ point of view takes place alongside that of Julia’s and both girls’ thoughts and feelings are explored. Julia’s dilemma over the special boys in her life lingers on, but she now has Emmie’s support, and when Emmie decides to reveal her secrets, Julia soon discovers the reason for her odd behavior. When the girls take advantage of an unexpected opportunity, the aftermath quickly spirals out of control, and they’re forced to face the consequences. This story leads to an unexpected conclusion. What is going on with Chloe and Davian and will Emmie ever be safe? 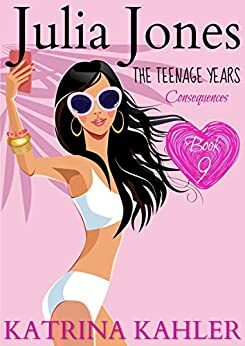 This is another great book for teen girls who enjoy stories filled with drama, friendship, romance, and suspense. Its a dream come true i cant believe it came out. hold on a sec ok my nick name that i like to call my self Berryx so could you guys plz give me a shoutout i got alot off shoutouts for all of you. ok this book was different first this is bad little Sarah is all over the news whitch that is crazy well its funny to think it this is what im thinking- sarah on couch with her mother, her mother gets the tv remote then switches the tv channel's then she stops at the news( oh no mama is gonna be mad) she listens to news then looks at daughter then tv daughter tv and thats going on for a while till she gets up tells sarah to stand next to the tv then sarah looks at her mother ooo she is burning red. kk thats you should do book 10 like kk. shoutouts: smith smith, joyce k, joy Lewis, Razzbeiry(sorry if i spelled ur name wrong), and cherry. do you play roblox? whats ur username? I have always loved kks books and this one was great too. i do wish that things would just sort out but i guess this series needs drama to keep going. Who do u like better Blake or Ky? Do u like Millie or not? I like the colors light green and red and i like blake better bc they have history and hes cuter and i absolutley hate millie bc she did the worst thing a bff can do everand i love this series so plz never end it kk! 5.0 out of 5 starsWho will she choose? Julia Jones a 18 year old with a dramatic life, two boys intrested in her- and she has to make a important decision of who to choose but, which one? Berryx- I used to go by the name "Smith Smith" and I go by the name Raspberry. Question for the week: Who do you like better Blake or Ky? Loved this! You should make Ky fall in love eith Chloe! Speaking of Chloe, you dhould make her Millie's couz! Remember when Emmie tried to teach Jack how to read minds? She should teach Julia! Yes Berry, I do have a Roblox account. Its RobloxPug1358. Whats yours? Also, Razberri I would choose Blake.